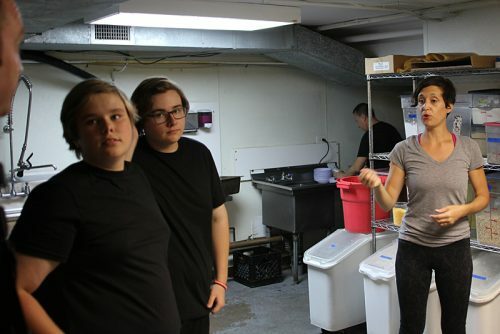 MY TEENAGED KIDS ARE WELL PAST THE AGE when everything they do is internet-adorable—born too early for full social media overexposure!—but especially in the summer, they’re with me a lot of the time as I roam the food scene, occasionally making cameo appearances at the edges of my stories. And a few months ago they tagged along to the Chicago Jewish Film Festival to see the film about their, and everyone’s, favorite Jewish grandmother, Ina Pinkney. We sat down and then I realized that right behind us were chef Thai Dang and his wife Danielle. I don’t know exactly how they know Ina—except, of course, that everyone knows Ina. But if either of my kids goes on to a brilliant career in the restaurant industry, I’ll know exactly where we were when they first made the contact that launched it. 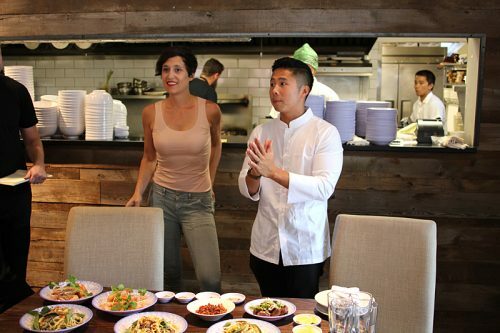 The Dangs, of course, went from a messy departure from Embeya, the West Loop Vietnamese-flavored upscale restaurant which recently closed, to announcing plans for a somewhat homier place called HaiSous. I attended a preview for it over a year ago, and went home with an invitation to the opening as soon as it was announced. 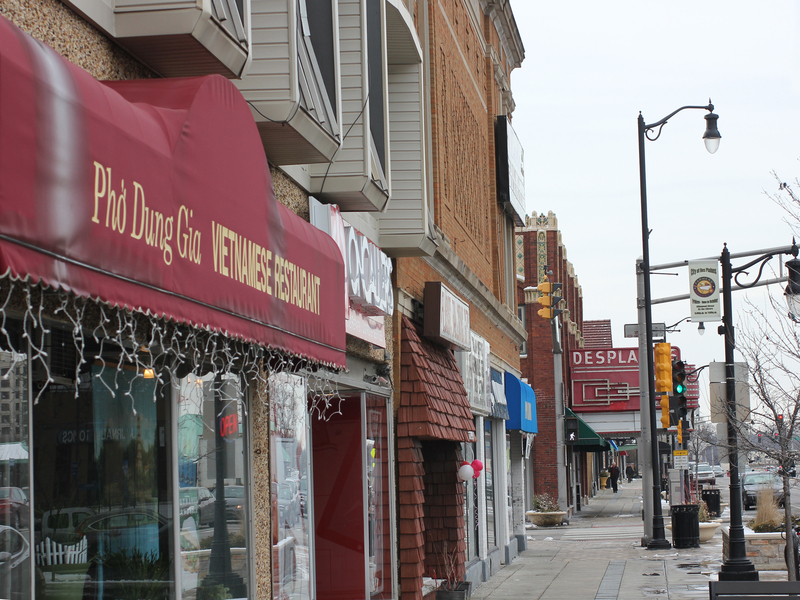 But chef proposes and the real estate market disposes—and by this summer, the long-delayed restaurant had found an entirely different future location in Pilsen. 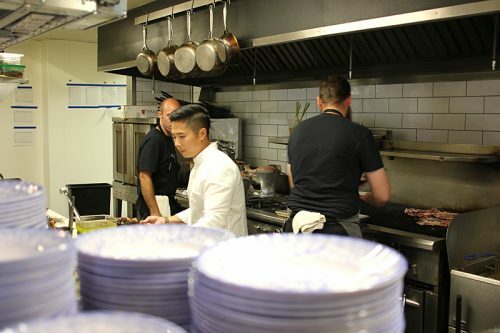 The hope is to finally open this fall—October?—and this time they feel it’s close enough to begin doing pop-up dinners, to get the staff some familiarity and practice with what HaiSous will offer. Which is where my kids move closer to center stage in this story. Danielle contacted me with an idea: how would we like to work one of the pop-ups as a family? I’d cover it, the kids would work, and we’d all get to try the food. I liked the first and third of those ideas just fine, but I loved the idea of my kids getting some exposure to the world of work. So we bought Dad a black T-shirt (I settled on my T-shirt-free personal style somewhere during the Reagan years, I think) and arrived at 3:30 at White Oak Tavern in Lincoln Park in contemporary restaurant gear, ready to be the lowest, least competent members of the team. On the other hand, once he was done with the splattery cracklings, Thai changed into his chef’s whites—revealing a back tattoo which he explained to me. It consists of five pictograms, and the center one is the logo of one of the most aspirational restaurants in the world—El Bulli in Spain—together with symbols representing the building blocks of cuisine (such as a hook to signify fish). HaiSous, it seems clear, still is going to straddle the worlds Thai Dang comes from—the simplicity of homey Vietnamese food (Embeya, famously, was named for his own childhood nickname) but the intense devotion to precision technique you had to have to work at the level of L20—or El Bulli. I followed Thai into the kitchen, surprised to see that the cooking seemed to be relatively modest—I guess I was expecting great heaps of food on roaring grills and in bubbling pots, but instead what seemed to have taken over the kitchen were four traditional Vietnamese clay pot grills with glowing coals inside (to judge by the smokeless fire, something like the bincho used in Japanese izakayas). 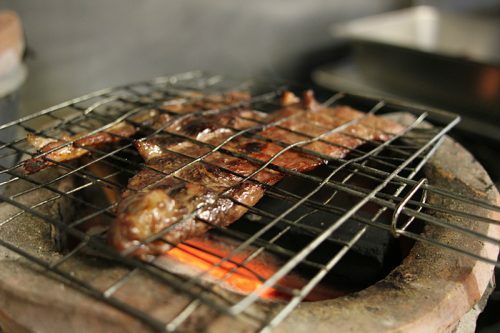 The meat is placed between thin wire grates and cooked directly over the fire, tended so it rises to sizzling temperatures but doesn’t burn; Thai showed me sticks of lemongrass which are used to brush oil on the meat, and fanned the flames through a vent in the bottom with a piec of cardboard. Thai and his crew were preparing samples of the dishes for the staff to taste before service. 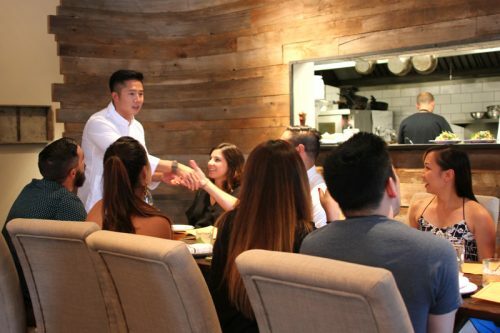 It was probably not strictly necessary that everyone understood the menu—almost everything was being served family style tonight, so there wouldn’t be a lot of explaining it to the diners—but if you’ve been trying to open a restaurant for over a year, you’re probably eager to have anyone taste your food. 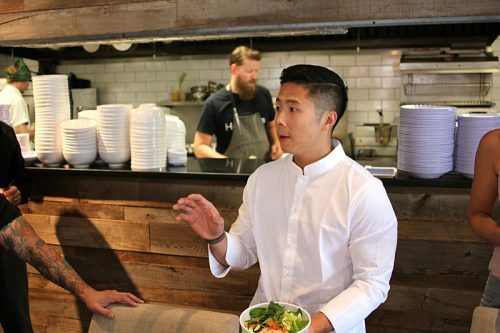 In that sense, I was impressed that Thai seemed so calm and together; it was a big night for him, the closest he’d gotten to his restaurant being open. The kitchen, behind the dishes Liam stacked on the pass. He and the other cooks started setting out dishes on the pass. 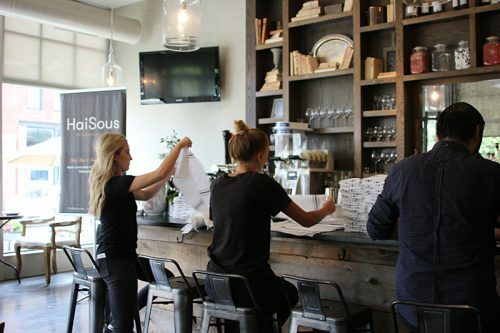 The front of house staff took care of other pre-shift duties, like folding menus and napkins. Liam and I had to puzzle how to assemble a sign without asking Thai, who Danielle said was the only one who knew how to put it together. Happily, we figured it out without breaking it. It was almost 5:00. Next he showed us fried shrimp—heads on but the shell removed from the sides, so you got the effect of how Asian shrimp are served, but didn’t have to pick them apart yourself. (If you like the fried shells, they were in there too.) 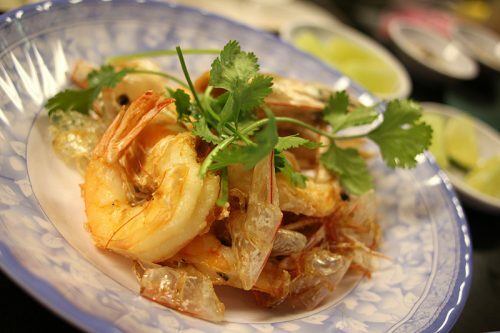 “This is Tom Chien Muoi Ot, fried shrimp. What makes it special is this thing,” he said, holding up a small dish containing seasonings. “Salt, pepper, chile, just three elements. And then you squeeze a lime into it to make this sauce—” he did just that, making a slurry in the dish. 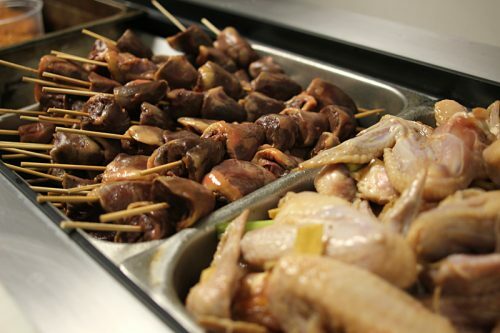 He walked through some other dishes—duck heart skewers (an add-on to the $50 ticket price) and duck wings. 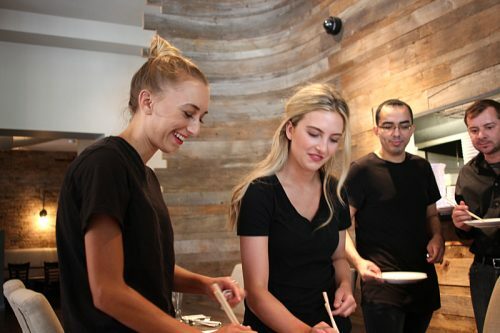 The front of house staff gave each of them a try—I’m not going to swear everyone tried a duck heart, though Myles did—and then the main dish was brought out: a bowl of salad and rice noodles, and plates of the pork that was grilled over the clay pot grills. Thai ran through a last couple of items including two simple desserts—rice pudding with peanuts, and a coconut milk dessert filled with grilled pineapple and other fruits. The team dug into and tried the different items, loosening up a bit. 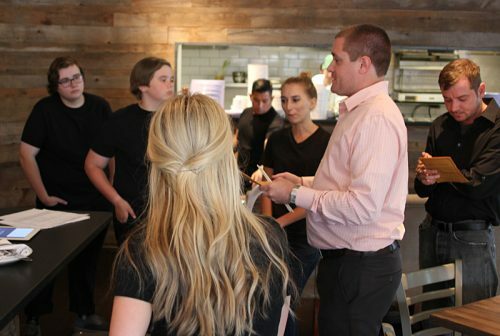 As Danielle worked with the bar staff, Steve Fladung, an old friend from L2O and RIA days who’s helping run the popups (and also helping create the wine list), gave the front of house staff a talk to get them set up to succeed tonight. We’d heard from the commanding officer, now here was the sergeant. “If you have any questions or issues, come to me,” Fladung said. “We want Danielle to be able to spend time with the guests, to welcome them, to be happy on the floor. 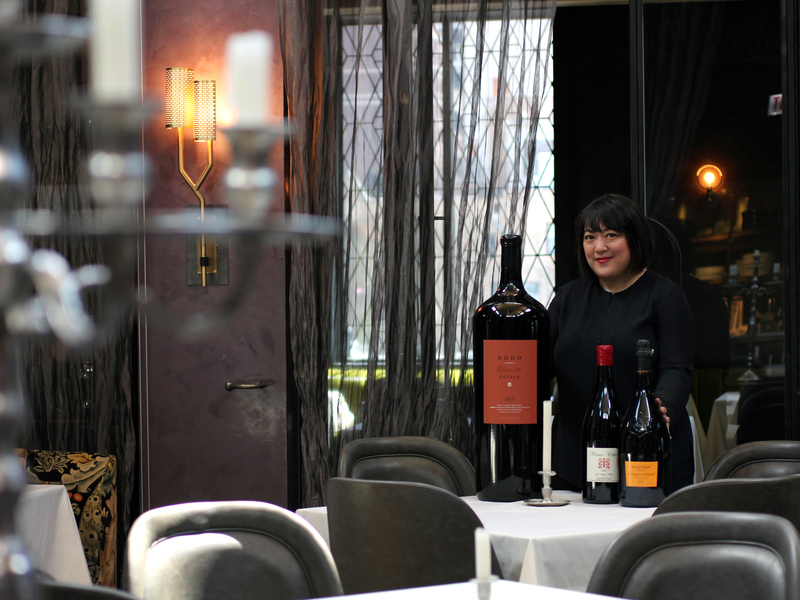 If there’s a problem, bring it to me.” I noticed that Myles was a little worried-looking; I reassured him that he didn’t have to take orders or know that Gruner Veltliner is “the perfect match for everything Chef cooks,” another thing that Fladung said a moment later. But it didn’t bother me for him to get a little exposure to that level of adult responsibility for other peoples’ night out, either. 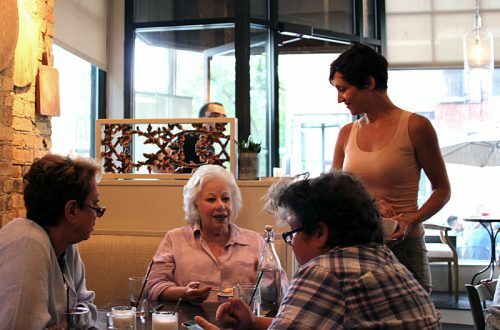 Also at that first seating was Ina Pinkney, and after the meal we compared notes. “It’s so fresh tasting,” she said, and I agreed. 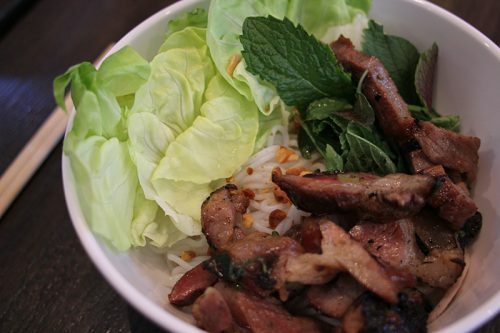 “Why doesn’t everybody put mint in salad?” Well, and grilled pork for that matter. But to make it work you have to know how to balance and counterpoint all the flavors, and that’s what Chef Dang is so good at. I kind of hate the word “elevated” when applied to upscale versions of traditional foods—I find too often the price is elevated and the food is merely enervated—but it fit here: this was the instantly accessible freshness of Vietnamese cuisine, but with fine dining care and precision in every bite. As we were leaving, I asked my kids what they thought about their first formal experience with work. Liam is 14 and he’s still a kid, so he was glad to do it and get paid, but just as glad to be done for the night. When I was 14 I worked at Mr. Dunderbak’s in the mall, and time never moved so slowly in my life as on those shifts. But Myles, 17, was another matter. “I liked cleaning the dishes. I found it kind of meditative,” he said. 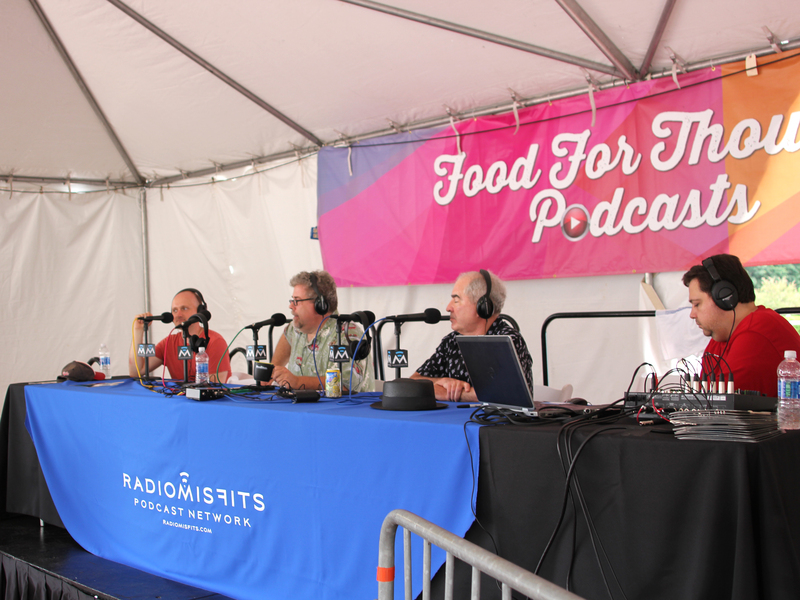 When Danielle asked him if he’d like to help out on the rest of the dinners, running plates and doing other things, he was genuinely excited—and believe me, so was I.
HaiSous will host pop-ups every Sunday this month at White Oak Tavern, and possibly ongoing until the opening. To get tickets and find out about upcoming dinners, go here. Disclosure: my children were paid for their work, and Myles will be paid for future shifts. I got dinner. 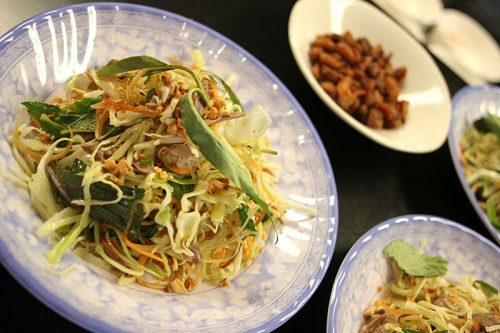 Correction: a Vietnamese dish name has been corrected. 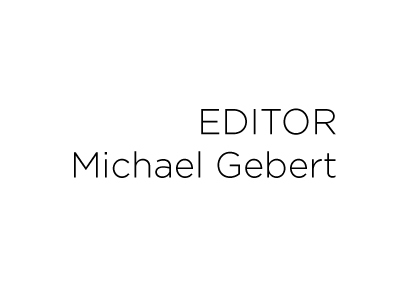 Michael Gebert is editor and upstairs-dish-carrier of Fooditor.